As of September 1, the European X-ray free-electron laser (EuXFEL) is ready for the research community’s experiments; the user page is here. In the September issue of Nature Methods, we present some of the experimental ideas researchers are exploring in that facility. Other XFELs are operational or in the works: FERMI facility, Linac Coherent Light Source at Stanford (LCLS), Pohang Accelerator Laboratory (PAL) X-ray Free-Electron Laser, SPring-8 Angstrom Compact Free Electron, Laser (SACLA), Swiss Free-Electron Laser (SwissFEL). One day, there might even be a XFEL that fits on a table-top (see below). The day is already here when scientists need to analyze mountains of XFEL-data. The EuXFEL will likely make those mountains grow in height. There are tools for that and likely more tools to come (see far below for a list of some tools). To complement the large XFEL facilities, a number of research groups are developing benchtop XFELs9,10. 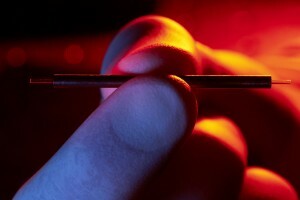 Such projects involve miniaturization of all aspects of the technology, including the accelerator. Some groups explore ways to pass a laser through plasma to produce bright, high-energy, short-pulsed beams. Separately, some researchers use a terahertz generator, which can provide sufficiently high pulse energies, says Franz Kärtner, a physicist at the University of Hamburg who also holds an appointment at MIT. His team, along with Petra Fromme of Arizona State University, is developing such a tabletop XFEL instrument. The scientists would like to use the instrument for coherent diffractive imaging and spectroscopy experiments on photosystem II, a protein complex involved in photosynthesis. Their compact XFEL approach, which will use a terahertz generator, lasers and nonlinear optics, is calculated to achieve photon energies between 10 and 12 keV, hard X-rays that can be harnessed for imaging at atomic resolution, says Kärtner. Although this compact XFEL will generate fewer photons per shot than a large-scale FEL—106 to 109 photons per shot as opposed to 1012 photons or more—the machine will be able to produce very short pulses, on the order of 0.5 femtoseconds. That is 10–100 times shorter than current FEL pulses. And if that comes to be, says Kärtner, the peak power of the instrument may be almost on par with that of an XFEL. In the instrument’s terahertz-driven accelerator there will be acceleration gradients between 500 MV/m to 1GV/m. It’s this high frequency that helps to compress electron bunches over short distances and that will let the developers to use compact electron guns. In this fashion, they will be able to shoot a coherent electron beam directly from a gun and emit an X-ray beam much like a FEL, says Kärtner. Tabletop XFELs fill an important experimental gap between Röntgen’s X-ray tube and the large-scale FELs. “There is nothing in between,” says Kärtner. That’s akin to a situation in optical science in which researchers need to choose between a light bulb and a large-scale optical laser such as the one at the National Ignition Facility at Lawrence Livermore National Laboratory. If the developers of the compact XFEL succeed at packing enough photons into each shot, the instrument will have potential applications in many fields, he says, including enhanced characterization of materials or higher-resolution medical and structural biology imaging. Kneip, et al. Nat. Phys. 6, 980–983 (2010). 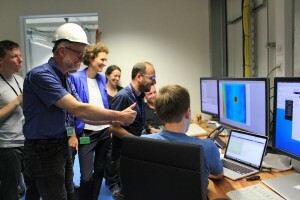 XFEL-based experiments produce mountains of data. At EuXFEL, there are two two-dimensional pixel detectors, which will each deliver 10-40 gigabytes of data every second of an experiment. Experimental data will be housed in the facility’s online systems and then moved to offline disk-based systems also at the facility where researchers can access and analyze it, says Filipe Maia, a biophysicist at the Uppsala University. The data torrent makes for “a daunting problem,” says Maia, “and currently there’s clearly a lack of user friendly tools.” This issue is a general trend and not unique to XFEL-based research, but researchers are getting better at handling datasets, which happens also as they familiarize themselves with the increasingly available tools. After publication, he hopes the XFEL-data will be transmitted to an online repository to share it with the community. One such resource is the Coherent X-ray Imaging Data Bank (CXIDB), which he built. CASS-CFEL-ASG Suite of tools for real-time monitoring of XFEL experiments, data analysis and visualization, raw data correction, crystal hit finding. cctbx.xfel Suite of tools for processing measurements made during SFX experiments at an XFEL. Built on Computational Crystallographic Toolbox. CrystFEL Software suite for processing SFX data. Cheetah Data analysis and high-throughput data reduction tools for SFX data. IOTA Spot-finding software for XFEL-based diffraction images. Part of the cctbx.xfel suite. SACLA analysis framework Real-time data processing pipeline at SACLA for serial femtosecond crystallography; it uses modified Cheetah and CrystFEL. WavePropaGator Software framework for simulating XFEL experiments. XATOM Software calculating and simulating X-ray atom interaction. Part of the software package Xraypac. XMDYN Simulation tool for modeling dynamics of matter that is exposed to high-intensity X-rays. Part of the software package Xraypac. Coherent X-ray Imaging Data Bank (CXIDB) A database for coherent X-ray imaging experiments. LCLS data analysis Data analysis resources at LCLS. Protein Data Bank (PDB) Data repository for protein structures.